Barclays customers could face significant delays accessing their cash today following a nationwide system error. It has led to huge queues in some branches and at ATMs, and reports of customers being unable to log into their online banking or unable to access telephone banking (see the Best Bank Accounts guide). The banking giant, which controls 15% of the current account market, insists the problem will not affect pre-arranged standing orders or direct debits which will go through as usual. It says its customers using their debit card to make purchases or withdraw cash should not experience any problems for the remainder of the day as the error has now been corrected. Yet the problems are not over. When MoneySavingExpert.com visited the Barclays Shepherd's Bush branch, in West London, before the lunchtime rush, there was already a massive queue inside, and to use the outdoor ATMs. 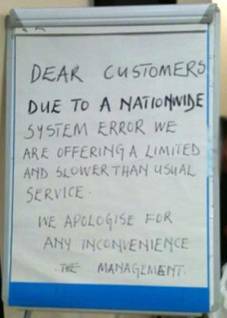 A notice was erected in the branch warning customers to expect a "limited service" all day. Click here to view the alert. This site was also contacted by a Barclays customer earlier today who reported massive queues in a branch in Kent. She said branch staff told her, at 10.30am this morning, she was unable to withdraw cash. MoneySavingExpert.com tried to access Barclays' online banking at lunchtime today on two occasions. The first time, we were told the system was unavailable, but we logged-on successfully the second time. Twitter has also been flooded with angry customers unable to log-in online or get through via telephone. If you're unable to make an important transfer let the recipient know. If you need cash and find the ATM queues are too long, then use a non-Barclays ATM which doesn't charge a fee. If the problems cause you to miss a bill payment and a subsequent charge or credit rating black mark is applied, ensure you inform Barclays so it rectifies the error (see the Financial Fight-Back guide). A Barclays spokeswoman says queues at this time of the month are usual as many employees are paid towards the end of the month. She adds: "Systems were running slow between 10.30am and 11.30am today which caused intermittent issues."